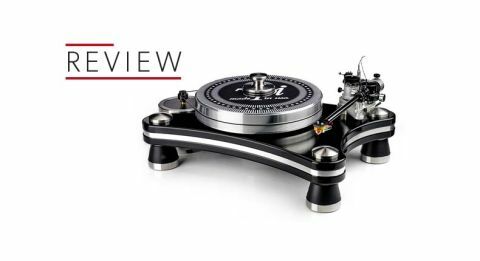 VPI Prime Signature review | What Hi-Fi? VPI’s solution turns out to be a range of sensible and wide-ranging improvements that improve the deck notably without spoiling its highly appealing character. The most obvious upgrade is to the plinth. On the original this was made of MDF covered with textured vinyl and then reinforced by a 3mm thick steel plate. The Signature’s plinth is now made up of two layers of gloss MDF sandwiching a chunky aluminium plate, and is notably thicker overall. This arrangement improves damping and rigidity, giving the arm and platter a better foundation to work from. The deck’s four feet are upgraded to improve isolation and the motor housing is taller to compensate for the extra height of the new plinth and feet. This larger motor housing (made mostly of steel) has more mass, which means lower resonance and greater damping of vibrations. The result is less energy being fed back into the deck’s structure through the surface they are sitting on and usually, better sound. Changing speed from 33 1/3 to 45rpm is done by manually moving the drive belt from one step of the motor pulley to the next. At this level we don’t think it’s too much to ask for this task to be done electronically. The 3D printed unipivot arm now has a black speckled finish and is rewired with high-grade Nordost cable. The grade of stainless steel used in places such as the arm board has been improved for improved rigidity and strength. Oh, and there’s a heftier record clamp that fits over the centre spindle. Some things remain the same. The thick 9kg aluminium platter, 24-pole AC motor and main bearing all remain unchanged from the original, and that’s no bad thing. The main bearing is an inverted design that uses a hardened steel shaft, a 60 Rockwell hardened chrome ball, and a phosphor bronze bushing completed by a PEEK (polyether-ether-ketone) thrust disc. It’s designed for precision and low noise, as well as longevity. This deck isn’t a particularly large unit by high-end standards. At 54cm wide and 40cm deep, it should fit on the top shelf of most supports. But it’s heavy, weighing in at just under 37kg, so make sure your support can cope. Despite VPI’s attempts to design in isolation it still pays to use a rigid, low resonance platform for the best results. Make sure everything is level before you set up the deck and it also helps to keep the support as far from the speakers as practical to reduce the amount of vibration fed into the turntable’s structure. You’ll get a better sound if you take care of such details. Those not familiar with higher-end turntables may find the arm somewhat fiddly to set up. It’s a unipivot design, where the bearing is a single sharp point onto which the arm bearing housing sits. This kind of configuration gives the arm an impressive freedom of movement compared to alternatives that use the conventional multi-bearing approach, but does mean the arm wobbles around a bit before settling when first placed on a record. The unipivot design makes it fussy about the alignment of the tracking weight too – get the weight off centre and the cartridge will lean to one side as it sits in the record groove. Arm bias can be set in two ways. There’s a pivoted mechanism that adds suitable sideways force or a tried and trusted VPI method – the one we opted for – where the innate tension in the exposed cartridge lead-out wires (the looped piece of cable that comes out the back of the arm) supplies the outward force. Either method works well. There’s plenty of adjustability built into the arm making fine-tuning of vertical tracking angle and cartridge azimuth easy. It helps optimise the performance from the cartridge, which can only be a good thing. If you’re not confident about setting up the deck, we would advise getting the supplying dealer to do it for you. The Prime Signature doesn’t come with a cartridge. We used a £1200 Lyra Delos moving coil with our review sample. It’s a great partner for the Prime Signature delivering a detailed and entertaining sound with a decent 0.6mV output. You’ll need a good system to make the most of this package, so don’t be tempted to skimp on the phono stage. We used Cyrus’s Phono Signature/PSX-R2 combination to great effect. The rest of our system is made up of our usual Gamut’s D3i/D200i pre/power and ATC SCM50 speakers. Those familiar with the standard Prime will be right at home with the Signature. While clearly more insightful and even more authoritative the new model hasn’t strayed far from the superbly balanced sonic presentation of its forebear. We start of with Four Tet’s There Is Love In You and the Signature sounds right at home in amongst the layers of electronic beats and sounds. The presentation is bold, punchy and solid. We haven’t heard a similarly priced record player deliver such a sense of command and composure. There’s just so much detail on offer, and it’s organised superbly. Every note has a purpose and goes into helping the music make sense. Don’t worry about timing. This VPI is terrific at conveying the myriad of rhythmic patterns on this album, and once it latches onto a rhythm track it doesn’t let go until every last drop of drive has been squeezed out. The ebb and flow of music is conveyed with a determined and assured quality that’s hard not to admire. We switch to Beethoven’s Ninth Symphony and the VPI responds with a grand soundstage populated with nicely layered and precisely positioned instruments. The imaging stays stable as the music swells and that sense of control is never lost, just as importantly it’s not overplayed either in the manner of some rivals. This VPI always sounds organic and fluid, as though the music has a free rein to go where it wants in its own way. This record player’s dynamics are impressive too. There’s an imposing sense of scale and power as the orchestra builds to a climax, but just as pleasing is the delicate way the VPI renders low-level shifts. It keeps a firm handle on the subtleties, refusing to lose any information on the way. The tonality of a record player is down to the cartridge (to a large degree), and here the Lyra does very well. It sounds even and relatively neutral with enough in the way of detail resolution and crisp timing to ensure it works well with all kinds of music. We love its transparency when used with this VPI pairing too. Changing the mood we play Nick Cave & The Bad Seeds’ The Boatman’s Call and the Prime Signature continues to shine. Cave’s distinctive vocals come through with all their grit, passion and nuance intact. As we listen to Into Your Arms we’re impressed with the solidity and harmonic richness of the piano. We like the sense of presence Cave’s voice has too. There’s everything we would want from the track – a subtle sense of momentum, warmth and weight to the midrange and enough dynamic subtlety to really capture the emotion at the core of the music. We just sit there, right to the last moment, lost in the drama of it all. The standard VPI Prime remains an excellent buy. It’s a hugely talented record player that is capable of seeing off all-comers at its price. But if your budget does extend to the Signature we would recommend doing so. It takes everything the standard model does and builds on it. There’s more insight, stronger dynamics and a lovely stability. In a top-end system the improvements will be obvious. Be in no doubt that the Prime Signature is the player to beat at its price. Highly recommended.